Directions: Licensing requirements include a vision screening, a knowledge test, and a driving skills test on the satisfactory operation of a motor vehicle. If you answer at least 22 questions correctly from the sample test found here AND you have thoroughly read the "Maryland Driver's Handbook" and "All You Need to Know About Your Driver's License", you will be well prepared to take the knowledge test for your learner's permit. All traffic must turn right. All traffic must go straight. A side road intersects ahead. Warning signs provide notice to road users of a situation that might not be readily apparent and are usually yellow with black markings. 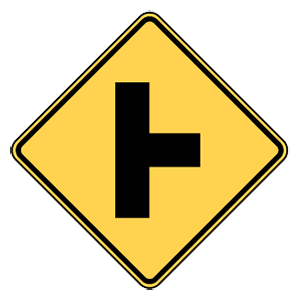 This warning sign tells drivers to be alert to an intersecting side road ahead. Only ____ can lower blood alcohol concentration (BAC) and reduce alcohol's effects on a body. The only way to sober up after drinking alcohol is to allow time for your body to eliminate the alcohol in your system. Nothing you can do, including eating and drinking, can accelerate this process. To prevent hydroplaning, lower your speed in response to wet roads and keep your tires in good condition. If you detect a loss of control, take your foot off the gas, do not apply the brakes, maintain the direction of the vehicle, and allow the vehicle to slow to a manageable speed. It is illegal for a person 21 years of age or older to drive with a blood alcohol concentration (BAC) that is ____ or higher. For drivers age 21 or older, it is illegal to drive with a blood alcohol concentration (BAC) of 0.08% or more. Driving while under the influence of alcohol is not only illegal, but dangerous. Which of the following blocks the smooth flow of traffic? Slowing down to look at collision scene. Using public transportation instead of your vehicle. Rubbernecking (the practice of slowing down to look at collisions or other out-of-the-ordinary things) contributes to traffic congestion and should be avoided. You are preparing to exit an expressway. When should you start reducing your speed? About halfway through the deceleration lane. As you approach the deceleration lane. Immediately upon entering the deceleration lane. When leaving an interstate, you should maintain your speed until you enter the deceleration lane, at which point you should reduce your speed to the exit ramp's posted advisory speed. The speed limit is increased at night. There are fewer cars on the roads at night. Distance and vehicle speed are difficult to judge in the dark. Night driving creates a unique set of problems for drivers. Due to the reduced visibility, it can be difficult to judge distance and the traveling speeds of other vehicles when driving at night. Drivers can see only as far as their headlights allow. Warning signs provide notice to road users of a situation that might not be readily apparent and are usually yellow with black markings. 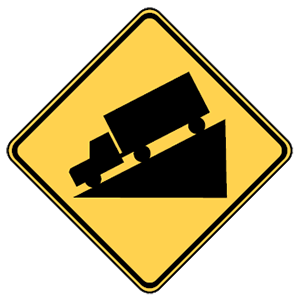 This sign warns drivers of an upcoming steep hill. Drivers should adjust their speed accordingly to avoid collisions and brake damage.